On Wednesday, February 22, at approximately 5:45 p.m., California Highway Patrol motorcycle Officer Lucas F. Chellew was in pursuit of a motorcycle eastbound on Fruitridge Road east of State Route 99 in South Sacramento. During the pursuit, a collision occurred, causing Officer Chellew to lose control of his motorcycle. 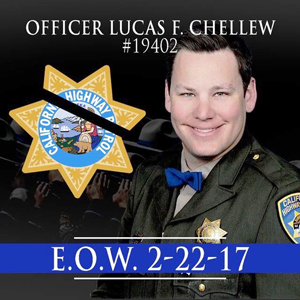 Officer Chellew suffered major injuries, and first responders on scene worked tirelessly to keep him alive as he was transported to University of California, Davis, Medical Center. Tragically, despite the valiant efforts of the paramedics and medical professionals, Officer Chellew succumbed to his injuries at approximately 6:11 p.m. 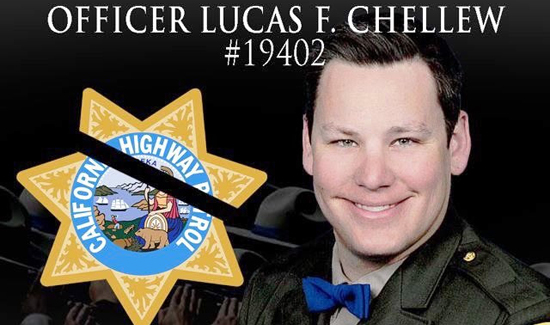 Officer Lucas Chellew, age 31, was an 8-year veteran of the California Highway Patrol. He is survived by his wife, children, and extended family including his father, a retired CHP Captain, and sister who is currently serving as a CHP Officer.